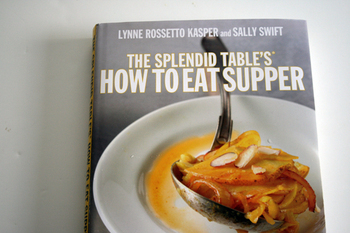 I have had this book, The Splendid Table's How to Eat Supper: Recipes, Stories, and Opinions from Public Radio's Award-Winning Food Show for about 2 weeks now and I keep talking about it to anyone who will listen. This usually means Pete. me: Honey, try this rice, really you have to. . .(me putting a wooden spoon in his face of very hot brown rice while he has other non-compatible food in his mouth) I cooked it a whole new way! husband: (Taking a very small nibble) Um, okay. . . .it's good? me: Yes! And, you know what the key is to everything? me: No, Fish sauce! Umami! me: I seriously can't believe this rice cooking method they talk about. This has changed my life, you know? Amazing! Oh! we need to get the little mesh sink drains at the Asian market, that would change ours lives too. They mention that in the book. me: That new Splendid Table Book, you know, from the radio show? me: In that book, it has a master salad dressing recipe and then 10 variations! And they also crush garlic with a rock! That is so great. me: That How to Eat Supper Book. And we can now make our own pho! me: I think Sadie is a super-taster. They have a test you can do to see if you are, but we need to go to an office supple store to get something for the test. I don't think she'll put it on her tongue, either. husband: What? Um. . . .what? Did you say super-taster? me: Yeah, from that new cook book. me: That Lynne Rossetto Kasper book. Not that he doesn't like food or talking about food—to give him credit, I do have conversations in my head and forget how much I have said out loud, so there is confusion sometimes. Add two loud kids and one crazy baby and the fact that I can never refer to anything, like a cookbook, by the same title. It's a gift of mine. It's a book for home cooks, even beginners, but it's not too basic. There's a wonderful equipment list, book recommendations, quotes from other chiefs, amazing recipes, advice on navigating ethnic markets, the list goes on—tons and tons of tips, shortcuts, and cool things I had never heard of. It somehow melds Italian, Asian, Indian, & Mexican recipes without it being the kitchen sink. 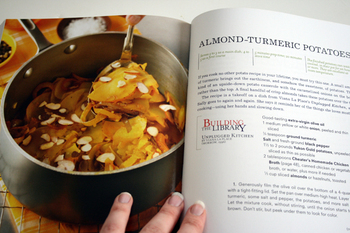 It also has a list of favorite vegetarian cook books, and hooray, most of them are not vegetarian, you know what I mean? 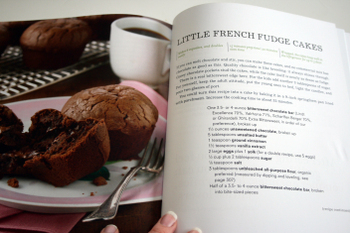 My favorite cookbooks save one, are not vegetarian. It's an intuitive cooking book. That's the deal, and that's how I cook. It describes basic preparations but then suggests many variations. The dishes sound amazing, but honestly, there's so much to read (without it being too text heavy, somehow) I haven't made many recipes from it yet. But I will report back on that. It's by Lynne Rossetto Kasper from NPR's The Splendid Table, along with her producer Sally Swift (who, after reading this book, am convinced is my cooking doppleganger) and I think this is why the book is so pleasant—it's like their laid back food loving radio show in book form, minus the caller asking how to cook tongue or cow brains. Very nice. I read cookbooks in bed, I'm one on these people, and this is perfect bedtime reading. It's right next to Anna Karenina, a good balance right now. Actually that's an interesting idea—to read a cookbook along with fiction, especially if it relates somehow. I need to remember this.